Nationals Park is the site of the matchup between the Philadelphia Phillies and the Washington Nationals on Thursday, September 7, 2017. The probable starting pitchers are Aaron Nola for the Phillies and Tanner Roark for the Nationals. Philadelphia opens at +147 while Washington opens at -157. The Phillies have a 63-65-10 over/under record and a 73-65-0 run line mark. The Nationals are 69-69-0 against the run line and have a 62-68-8 over/under record. The Phillies have a 53-85 overall record this season. Starting pitcher Aaron Nola has a 10-10 record with an earned run average of 3.72 and a WHIP of 1.22. He has 148 strikeouts over his 142.2 innings pitched and he's given up 133 hits. He allows 8.4 hits per 9 innings and he has a FIP of 3.33. The bullpen has an earned run average of 4.45 and they have given up 474 base hits on the year. Teams are hitting .258 against the bullpen and they've struck out 446 hitters and walked 190 batters. As a team, Philadelphia allows 9.4 hits per nine innings while striking out 8 batters per nine innings. They are 23rd in the league in team earned run average at 4.71. The Phillies pitchers collectively have given up 1,278 base hits and 641 earned runs. They have allowed 189 home runs this season, ranking them 7th in the league. Philadelphia as a pitching staff has walked 448 batters and struck out 1,083. They have walked 3.3 men per 9 innings while striking out 8 per 9. They have a team WHIP of 1.41 and their FIP as a unit is 4.60. As a team Philadelphia is hitting .250, good for 20th in the league. The Phillies hold a .409 team slugging percentage and an on-base percentage of .314, which is good for 26th in baseball. They rank 19th in MLB with 8.6 hits per game. Freddy Galvis is hitting .257 with an on-base percentage of .308. He has 136 hits this season in 530 at bats with 57 runs batted in. He has a slugging percentage of .392 and an OPS+ of 85. Cesar Hernandez is hitting .284 this year and he has an on-base percentage of .359. He has totaled 123 hits and he has driven in 28 men in 433 at bats. His OPS+ is 106 while his slugging percentage is at .418. 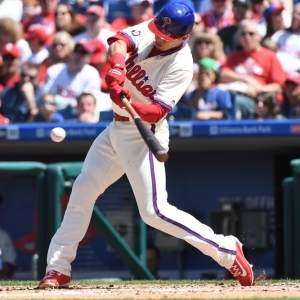 The Phillies have 1,186 hits, including 251 doubles and 144 home runs. Philadelphia has walked 412 times so far this season and they have struck out 1,203 times as a unit. They have left 929 men on base and have a team OPS of .723. They score 4.14 runs per contest and have scored a total of 572 runs this year. Washington has a 84-54 overall mark this year. With an earned run average of 4.48, Tanner Roark has a 11-9 record and a 1.32 WHIP. He has 141 strikeouts over the 156.2 innings he's pitched. He's also given up 151 hits. He allows 8.7 hits per nine innings and his FIP stands at 4.16. The bullpen has an earned run average of 4.65 and they have given up 397 base hits on the year. Teams are hitting .258 against the Nationals bullpen. Their relievers have struck out 368 batters and walked 141 opposing hitters. As a team, Washington allows 8.1 hits per nine innings while striking out 9 batters per nine innings. They are 6th in the league in team earned run average at 3.82. The Nationals pitchers as a team have surrendered 1,113 base knocks and 523 earned runs this season. They have given up 166 home runs this year, which ranks 21st in Major League Baseball. Washington as a staff has walked 419 hitters and struck out 1,232 batters. They give up a walk 3.1 times per 9 innings while they strike out 9 per 9. Their team WHIP is 1.24 while their FIP as a staff is 4.02. As a team, they are batting .268, good for 3rd in the league. The Nationals hold a .455 team slugging percentage and an on-base percentage of .334, which is good for 8th in baseball. They rank 4th in MLB with 9.2 hits per contest. Daniel Murphy comes into this matchup batting .320 with an OBP of .379. He has 152 hits this year along with 88 RBI in 475 AB's. He maintains a slugging percentage of .549 with an OPS+ of 136. Ryan Zimmerman is hitting .302 this season and he has an OBP of .361. He has collected 137 hits in 454 at bats while driving in 91 runs. He has an OPS+ of 133 and a slugging percentage of .562. The Nationals as a unit have 1,275 base hits, including 270 doubles and 189 homers. Washington has walked 467 times this year and they have struck out on 1,107 occasions. They have had 940 men left on base and have an OPS of .789. They have scored 5.2 runs per game and totaled 718 runs this season. Who will win tonight's Phillies/Nationals MLB game against the spread?